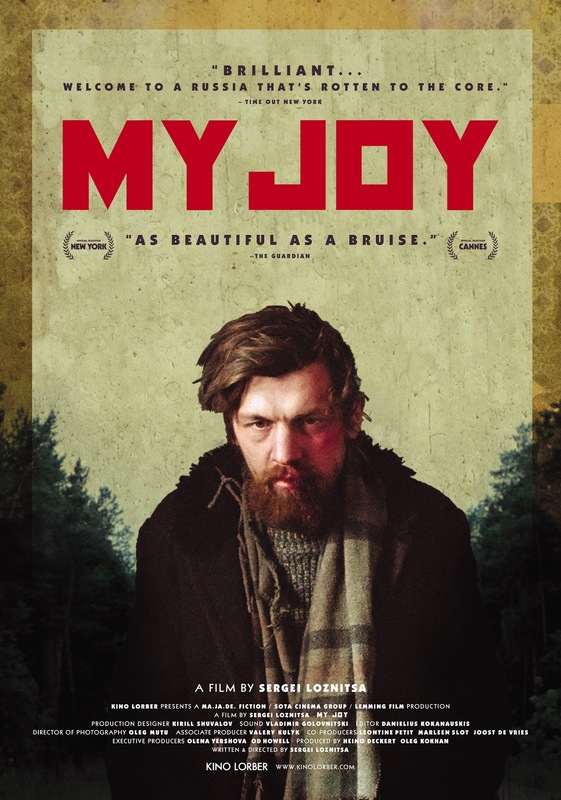 Cozied up in a nook between brutal waking nightmare and dread-soaked fever dream, Ukrainian filmmaker Serhiy Loznytsya’s 2010 film MY JOY (CчacтЬe Moё) presents a bleak portrait of modern Russia as a destinationless country wracked by systemic political and cultural maladies that have infected its towns, and travel the vasculature of its highways, borne upon power-mad bureaucrats, damned civilians and fragments of history. Loznytsya, also the writer, hands down this grim diagnosis through a series of vignettes and incidents that move between characters, seasons and, in the case of two WWII set period bits, decades, while always returning to the increasingly tragic story of an anonymously likeable trucker, whose hauling run through western Russia turns into a phantasmagoric road trip to the country’s gangrenous heart. Though perhaps, at times, provocative to the point of baiting, the film never settles for hollow shock value, but instead digs to thrilling depths to examine the true, meaty horror of human corruption. Now screening just in time for Christmas! While a healthy chunk of MY JOY is devoted to telling the tale of trucker Georgy (Viktor Nemets) who, after trying to help a teenaged prostitute he meets while stuck in an endless traffic jam, takes an ill-fated detour down a rural back road, the crux of the film is a critique of (or attack on - you be the judge) Russia’s political landscape and social order. Stopping just short of suggesting that the country might have been better off had it ceded to the Third Reich, Loznytsya depicts a nation that never fully recovered from communist fascism, continuing to eschew art for "productivity," and allowing itself to be eaten through by governmental corruption… desperate, lonely and lost, but so accustomed to its sad, turbulent course that any attempt to alter the country’s trajectory – to find an alternate route around the cultural traffic jam - is met with violent, near-instinctual opposition. It should be stressed that what makes MY JOY such an intellectually and emotionally draining experience isn’t anything to do with its visual content – it has none of the grotesque brutality of IRRÉVERSIBLE, the self-congratulatory gore-mongering of the SAW series or the surreal, nauseous dread of a David Lynch joint. Despite a number of scenes that crackle with cynical, ink-black comedy, the film is a thoroughly modern existential bummer that just plain gets under your skin, and into your head. Beyond its specific deconstruction of Russian society, MY JOY raises larger questions about what defines a person’s identity. “Is a cop still a cop when he’s not in uniform? What about if he’s somewhere his authority isn’t recognized?” - these are Semiotics 101-level riddles, but when you extrapolate the gravity of their implications to a macrocosm, the result is unsettling. If, in the former case, the answers are yes, a cop is always cop, what are the ramifications for a prostitute or a thief – what does it say about their inherent nature as people? If, on the other hand, either answer is no, then, out of uniform or in that other place, what is he? In Loznytsya’s Russia, where vestiges of the communist ideal mean an individual is defined by the function he or she performs, we see man after man, woman after woman, turned to ghosts – soldiers without wars, off-duty police and, in an inexplicably harrowing scene, a market square full of dead-eyed shuffling husks without purpose, angry, disconsolate and moaning like the undead. Then, of course there’s our truck driving protagonist, whose dark journey is most certainly one of identity lost, whose trials answer bigger question: Can a displaced man find purchase in a land of diminishing space? Or, if that man is truly a broken cog, must he build a new machine in which to spin?